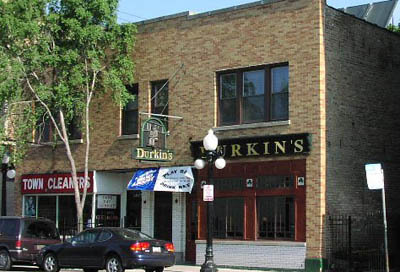 DURKINS TAVERN is home to Illinois Fighting Illini Athletics, and it's also one of our favorite Irish pubs in the Lincoln Park area. If you love a good sports bar, this is your place, with an unbelievable forty television screens filling the entire joint with the best games of the day. Fridays are awesome for their twenty-five buck deal which gets you a buffet meal and all drafts, well drinks, and Red Bull mixers between 6:30 PM and 11:00 PM. Bottled beer and all call drinks can be had for just a buck with that deal. We're also big fans of their football special, which keeps you satisfied with food and beer for eight hours while you enjoy the big game! This place is always crowded because everyone knows it's the best.